The natural way to straighter teeth – the no-braces approach! In our last month’s blog titled ‘Take note if your child is a mouth breather’ we discussed the negative impact that mouth breathing can have on the development of a child’s facial and dental structure. The sooner nasal breathing and correct swallowing is established, the better. It is important that mouth breathing be treated early so the negative impacts can be reduced or even avoided. Don’t put it off, as the development of the face is 90% complete by early adolescence and changes are harder to make. The good news is that The Dental Lounge, Robina, offers a treatment system that can help correct the problem of mouth breathing, which in turn can assist in correcting breathing problems and misaligned teeth. The Myobrace System is a no-braces approach to help improve the alignment of the jaw and tongue and is most effective after a child’s permanent front teeth have come through, but before all the permanent teeth have erupted. It is a three-stage appliance system designed to treat upper and lower jaw problems while correcting poor breathing habits. Myobrace looks similar to a mouth guard and is worn for just 1-2 hours in the day and overnight while sleeping, for approx. twelve months. The treatment process also involves activities to help the child develop jaw muscles, correct jaw and tongue position, improve correct breathing and swallowing. Daily use of the Myobrace results in straighter teeth giving improved function, as well as leading to better facial development. In many cases, this can save thousands of dollars long term by eliminating the need for braces when the child is older. By correcting this problem early in life other issues such as poor sleep, poor concentration, and self-confidence can also be prevented. Our team at The Dental Lounge Robina, have completed training with Myobrace Australia, and we have successfully helped patients who have benefited significantly from the system. And, although the Myobrace appliances work most effectively on younger children, we do have teenage and adult treatment options available. Click here for more details. 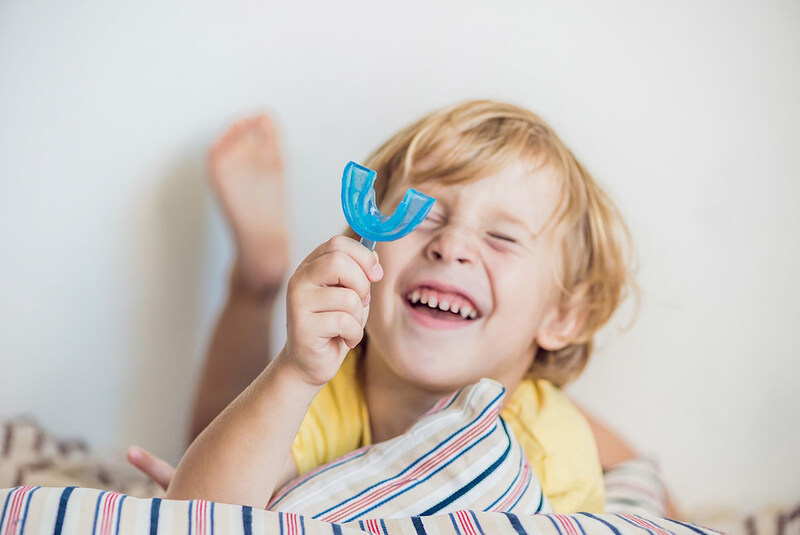 If your child is mouth breathing, grinding teeth during sleep, or their jaw or teeth are starting to become poorly aligned, contact us today (07) 5580 8855, so that we can discuss your specific situation and help you make the best decision. The Dental Lounge @ Robina – Dentistry with a difference!